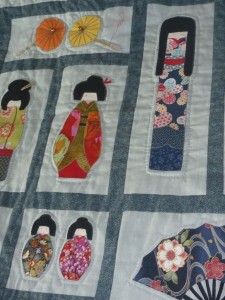 Binkie’s Japanese Dollies quilt was her first go at applique, encouraged by a friend. She discusses her love of hand quilting and how quilting is helping her to get through a difficult time. Binkie explains quilt frames, Sashico [Japanese quilting] and quilting terms such as ‘fat quarter’ and ‘stash’, as well as ‘the rocking motion’ needed for quilting. Later she describes how welcoming she has found the quilt community, critiquing other quilters work and the experience of buying from American quilt shops. Pam Stead [PS]: This is Pam Stead. I am carrying out an interview with Binkie Thomas and the ID number for this interview is TQ.2014.025. We are in the interviewee’s home in Abercynon in Rhondda Cynon Taf. The date is the 21st August 2014 and we’re starting the interview at 11 o’clock in the morning. Right, thank you Binkie [laughing] that’s the formalities over with. I just need to tell you that at the end of the interview I’ll be asking you to sign the consent form. PS: …that I sent you earlier and I’ll also be taking some photographs and if there’s anything in this interview that you don’t wish to consent to then it will be removed and if you decide not to go ahead with making the whole thing public than that’s absolutely fine as well. Now if you need to stop me at any time, please do so. OK, right? PS: Right, off we go. Would you like to show me your quilt please? PS: Oh, that’s stunning, that’s absolutely gorgeous. Yeah, lovely. Right, Binkie, over to you. PS: Why did you make this quilt? BT: This quilt is a large lap quilt and it’s covered in lots of little Japanese dolls and they’re all appliquéd on by hand and then I’ve hand quilted round them and it’s mostly hand quilted. It’s just joined together, the sashing was joined together on the machine. And I found the pattern for this at the Festival of Quilts three years ago. It was being sold by a lady called Susan Claire Mayfield who is a quilter from New Zealand and she goes under the name of ‘The Gourmet Quilter’ because she says everything is delicious, [PS laughs] so I went with my friend because I hadn’t done any quilting at this time, really. I’d just joined a group and I saw this and I thought ‘I want to make that but I have no idea how to do it, I have no skills in quilting whatsoever’ and I thought ‘I’m never going to be able to do it’. But the person I went with, Jan Price who’s actually one of the Committee Members of Region 12 who took me under her wing said ‘of course you can do it, we’ll get the pattern and we’ll have a go.’ So I spent eighteen months sourcing fabrics. Everywhere I went I picked up a fat quarter or sent off for things because I wanted a lot of Japanese fabrics, because it’s a Japanese style quilt and after eighteen months or so Jan thought I was ready, so one fateful day we got here and she showed me how to do it, you know, put the stuff on and iron it on and do it. And she showed me one patch and I was absolutely hooked and I just couldn’t put it down and so that’s my little quilt. PS: Well, it’s lovely, absolutely gorgeous. So tell me a bit more about all the, how you quilted it? PS: Can you explain shadow quilting? BT: Yes, it’s just going round the shape and making it stand out really because it ‘pops’ with the shadow quilting, it makes it stand out a little bit more. Yes. So that’s my little quilt. PS: So, you said that you spent eighteen months sourcing your fabrics [BT: Yes] that sounds like quite a long time, so were you making some other quilts in the meantime? BT: I’ve done about five or six quilts but they’re very plain, just squares and oblongs and things because I’m not terribly good at anything, so I’m just feeling my feet really. So this was a complete departure and I’ve just become so hooked and I love the primitive quilts now and I’m in the middle of starting one of those, a block of the month and loving it and so that’s what I shall be doing. But I want to do a wholecloth quilt as well [PS: Right] Yeah, so I’m doing a class with Sonia Fox and we’re going to do a whole Welsh wholecloth quilt, with Welsh designs and a group of us have got together to do that so we’re in the process of planning it at the moment and we’re going to transfer it onto the fabric. I’ve got the most fabulous fabric from Oakshot, which it’s a sort of magenta, really bright, it’s really beautiful, so I’m really looking forward to that but I’ve been looking at frames as well because the frame I’ve got is wonderful, it came from America and it sits on a bean bag and rotates and is lovely, but I’ve just found a proper floor frame now called an Ulmar and this is amazing. It’s made by the Amish and it’s very portable and will fit under a chair and I’m just thinking, it’s about £200 plus the postage and whether I can afford it and all the rest of it so I’m looking at that as well. PS: Can I ask you to explain what a frame is for? BT: Oh, yes. The frame, the quilting frame is what. Because a quilt is made up of three layers and you sew through the three layers you need to put it on a frame to keep it sort of, not taut but so that you can actually quilt evenly all over it and the frame is very, it gives you a, it’s very substantial and it’s nice to work on. You can do it without, but I never think the stitches look even when you do it without a frame. PS: You’ve got your stitches very even now [BT: Now yes] is that difficult? BT: Well the first quilt I did, which I’ve got upstairs I’m always going to keep because I started off on that one and I started off in the middle and the stitches are about ¼” long and by the time I got to the edges they’re about 8-10 stitches to an inch which I think is not bad. And on that quilt it suddenly clicked how to do it, so I will never part with that one, but this is the one I’m proud of. BT: Quilting’s become very much a part of my life. I’m going through some quite heavy family problems at the moment and without quilting to sit and do in the evenings or in the afternoons when I’m visiting my mother in hospital I think I would go bonkers basically and when you’ve got something in your hands to sew it just takes your mind off everything and you can just relax and let go. And I think quilting should be put on prescription on the NHS [PS laughs] because I think if people could learn how to do it they would be so happy. Yes and it’s very important to me and it’s very important to my husband because he knows that when I’m doing it I’m very happy so money is no object with him. He says ‘as long as it keeps you happy, you do what you like my angel’ so there we go [laughs]. PS: What a wonderful man! BT: He is, he is! [both laugh] He knows which side his bread is buttered [laughs]. You can cut that bit out if you want! PS: No not at all [both laugh]. Good, so tell me some more about the fabrics in this quilt and sourcing them because obviously really important to you to get the right fabrics. BT: It is. A lot of my inspiration has come from a quilter called Susan Briscoe. 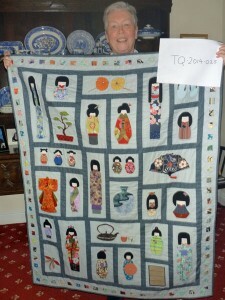 Now Susan Briscoe is very big in the quilting world in Sashiko. 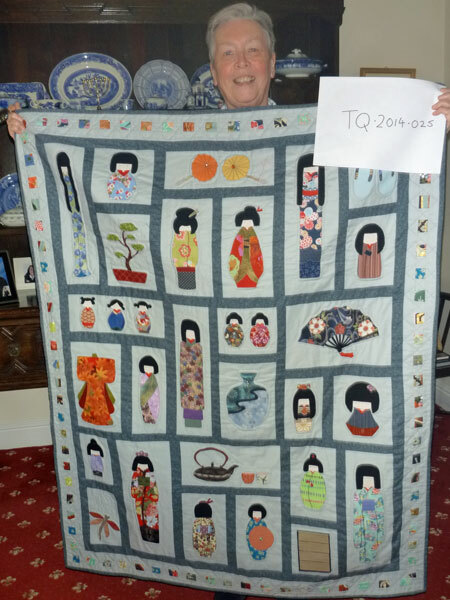 She learned her Sashiko when she was teaching in Japan years and years ago and has become one of the leading authorities on it, written loads of books and she’s got a shop and I’ve got lots of things from her. In fact two months ago I went to the Quilting Guild put on traditional quilting retreats up in the Midlands and Susan Briscoe was our teacher and we had the most wonderful time there. She is such a clever woman and the stuff that she produces is just mind-boggling. And unfortunately, because I’m so old I know that I’m never going to live long enough to get that good, you know so I just have to do what I can while I’ve got the time left [laughs]. But she is amazing and I do find her inspirational and a lot of these fabrics have come from her. Cos she imports straight from Japan. PS: So that was important. BT: That was important to me and the other thing that I find very important is the thread that you use because I just love Orofil thread. I’ve tried them all, but the Orofil is just lovely. But I do like the Gutterman, but it’s a bit stiff, so I use that and I use a size 10 quilting needle. That’s just right for me although I find it hard to thread because, you know, I’m getting old. So what I’ve done, I sourced on eBay these very cheap needle threaders and there’s a man that actually glues the bits in so that they last quite a long time and I buy 20 at a time [laughs] because I love eBay. PS: He glues the thread in? PS: Now you said that you felt that you started this too late. Do you think you could have felt these benefits you talk about earlier? BT: Well I’ve always dabbled in it and I’ve done hexagons for about thirty years and I sew hexagons together and I don’t know what to do with them because I didn’t know how to quilt or anything. And what happened was that three years ago I went to a craft show in Cardiff, the Motorpoint Arena and The Guild had a stall there and manning the stall was Jackie Pew who was the Regional Co-ordinator at the time and she made me really welcome and I said I was interested in learning how to quilt and she said what I needed to do was to join a group and she got her book out and she said ‘this is the person you need to speak to’ and ‘this is the person you need to go to’ and she was really kind and she took my name and address and she followed it up, you know, followed me up which I felt it was very inclusive you know and I felt very wanted, which I’ve never felt with a group before and I was really pleased about that. So I went along to the group and they made me really welcome and they showed me the basics. Unfortunately it was on a Monday afternoon I had great difficulty getting there so although I still pop in from time to time I actually go to a group called Cibi which meet in Abergaveny, but it’s just once a month. But I go to classes you know at weekends and things like that and days and learn. And Jan Price who’s the committee member who took me under her wing, she knows everything and she teaches me, you know, what she does she comes over every Saturday to give me a lesson of some sort or another. I’m just so blessed really because people have been so welcoming. And you know people were giving me things. People gave me books, they gave me pieces of fabric, so I didn’t have to buy, needles, thread, you know I urge anyone to go to a class really because everyone’s so lovely. Yes. PS: That’s been your experience. BT: That’s been my experience. Aren’t I lucky? PS: Well, I think perhaps it’s reflective of quilting generally, do you [PS: Yes] think or not? 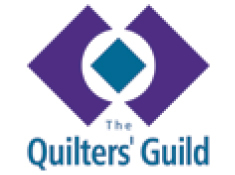 BT: I think quilters are some of the most generous people I really do. I mean Jan yesterday. We learned how to do folded patchwork last week and I didn’t have any fabric to go with some that I wanted and she popped in yesterday with four fat quarters. Now I mean she wouldn’t have any payment for it, she just said ‘no, no, no you must have these’ How lovely is that! BT: Oh fat quarters. It’s a length of material and I think its 22” by 18” is it? Something like that. I’m not really sure. It’s part of a metre or something. I’m still in yards and inches, so don’t ask me about centimetres and metres because I have no idea whatsoever. But is it about a quarter, yes [PS: A quarter of a metre] a quarter of a metre and it’s just a nice amount really to be able to do something with. So yes, I was very lucky with that. 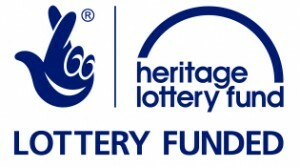 I mean the one thing I do find is fabric is so expensive and I think every quilter in the British Isles feels the same and I started to source fabric in America and when I started three years ago we all started going to Paduka, Hancocks of Paduka and getting loads sent over. And then the post people started to slap on huge amounts to sort of bring it in so that wiped out the profit really. But I’ve got a friend in America and she brings me things over. But the fabric over there is maybe a quarter of the price over here. That’s so unfair. And my daughter lives in Australia and it’s the same in Australia, it’s a quarter of the price. It really is unbelievable. So when I see her I get a load. Yes, but it’s just not fair that we pay so much duty. Yes. PS: Talking about fabric, you know, do you keep a good lot of fabric around? PS: So is stash something that people, what is it? BT: A stash, it’s not a pile of money, it’s a pile of fabric but to me that means as much [PS laughs] and people have their own stashes and a lot of people I know have stashes that are never used, they buy the fabric and it’s just left there. So I’ve made a resolution now that I’m only going to buy for actual things that I’m going to do unless something really grabs me and I really want it, which happens all the time! [Both laugh] So but, I mean I’ve got a friend Gwen who, she’s got loads and loads and loads, she’s got a whole room full and she’s now trying to get rid of. Her granddaughter’s taking loads off her, but I mean that’s what we do isn’t it as a quilter. I mean it becomes an obsession. Yes. PS: Which bit of it becomes the obsession? BT: All of it. I mean all of it, I just love looking at needles. Jan and I, we were so, we went up to Daventry to this quilting weekend and I had been looking at thimbles and researching thimbles for a very long time. And everyone in America uses a thimble called a Roxanne thimble and you can’t get them over here. They’re terribly expensive and they are sort of an open thimble and they are very comfortable apparently and you have to be measured for them so we found out that the only place in Britain was The Cotton Patch in Birmingham that sold these, so we made a detour to go to The Cotton Patch and the lady there was lovely and she said ‘well they’re so expensive people won’t buy them so we’re reducing them’ so she said ‘we’ve got around twelve left’ so Jan and I both tried one on each and I’ve always wanted one made of bronze because I’m very much into Roman soldiers [both laugh] and I have a lot of bronze things. But Jan thought she’d go for the silver one so she had the silver one and I had the bronze one. But she paid about £50 for hers and I paid £42 for mine, but it’s something that never leaves my side, it’s with me all the time. It is so comfortable you do not know you’re wearing it and its money well spent and I love it, so there! [both laugh]. BT: Well Jan and I’ve got a savings club [PS: Ah] and we put away every week, we pay into our savings club so that we’ve got money to do this because you would never do it otherwise. I mean you know just fork out 30 or 40 quid every week or so but no, no we save for it. But last week we went down to Porthcawl to Marge Abraham because some of us have got together into a quilting bee, hand quilting and we meet about four times a year and we met in Marge’s house this time and Marge showed us a quilt she’s just finished to go over her coffin. A coffin quilt! [both laugh] And we thought that was fantastic and she’d put it on her friend’s coffin who’d died and she was going to make it just a little bit bigger because it didn’t hang quite nicely down the sides, but I mean how wonderful is that! I think that’s just amazing so I’m going to make myself a coffin quilt now, I’m going to have it all appliquéd, it’s going to be fabulous [laughing]. PS: Will it actually go with you? BT: No, I would never burn it. Oh no, it’s got to be left to somebody, hasn’t it? What a waste. When I die I’m going in a cardboard coffin in the back of somebody’s car. You know I’m not wasting money on an undertaker [both laugh] so no, no, the quilt will then go onto somebody else’s coffin. I mean I could get, I have actually stipulated that when I die, this isn’t really quilt related, but I’m going to be buried with a Union Jack on my coffin because I’ve earned it. First of all I’m a magistrate and secondly I am a naturalised British subject and I’ve had to fight for naturalisation and people who live here take it all for granted and therefore I want the Union Jack on me when I go. BT: So there we go [both laugh]. PS: You’ve talked about this obsession [BT: Yes] and how it becomes an obsession. Is that just you? PS: It should be prescribed! BT: I think so, I do [laughs]. BT: I used to, I have a sister with Down’s syndrome who lives with me and she used to go, free of charge, to the Summer Schools in Glamorgan about twenty years ago and I used to have to take her down and one day, I’ve always wanted to do calligraphy and I popped into the classroom and I said to the bloke who was doing it, Peter Jenkins, ‘I’ve always fancied this’ and he said ‘why don’t you stay down with your sister and do it?’ So I did for fifteen years [laughing] [PS: Wow] I know! I got very into calligraphy and I still love calligraphy, but with calligraphy it’s messy. It’s ink and paper and pencils and you can’t just pick it up and put it down or put it in your bag and take it with you. You know, it’s something that you’ve got to do, close the door and concentrate. With sewing I can take some English paper piecing with me which is what I do with my hexagons and things. I can go and visit my mum and sit and sew. She doesn’t speak very much and she just looks at me adoringly, so I just sit and sew whilst she does that. It’s wonderful. I’ve got grandchildren that I take to ballet and things and I take it with me and I’ve always got something to do. I’m never bored. So it’s great. PS: So it’s important to you. BT: Very important. I can’t be doing with sitting around, just hanging around. PS: And these quilts in your mind [BT: Yes] that you want to make [BT: Yes], there’s the wholecloth quilt [BT: Yes] and a coffin quilt [BT: Yes] any others? BT: It’s when you turn the fabric, the pattern, you’ve got a pattern of a bird and you hem it really, you turn the raw edge under and sew it down. But I use Steam-a-Seam Lite 2. Thereby hangs a tale! BT: Right, Steam-a-Seam Lite 2. It’s like paper and you draw your picture onto it and then you iron it onto your fabric and then you cut round it and then you peel off the back and then it sticks to fabric. So that you can make it stick to fabric. Now the makers of Steam-a-Seam 2 Lite have made an absolute fortune out of quilters, but unfortunately the people that they source their paper from have gone under and can no longer produce it so all production of Steam-a-Seam 2 Lite has ceased. The whole of the American quilters are up in arms. And there’s been huge problems. So they’ve now sourced a new supplier and it should be back online in about October, November of 2014. So we, everybody’s waiting with baited breath. Now over here it’s very, very expensive I mean it’s about 8 or 10 pounds a metre, it’s something ridiculous so I get it in America and I pay something like £25 for a roll of loads and loads of metres. I mean we’re ripped off in this country really, so anyway I’m waiting for that to come online and I shall be telling her to bring me two rolls over of about fifty metres [both laugh]. BT: That’s right and then you can sew round it and I use a very small blanket stitch to sew round. PS: Why do you need to sew it when you’ve already stuck it? PS: And is there a special stitch for it? BT: Well I just use blanket stitch but you can use whatever you like. This is the thing about quilting, and you get patterns. You don’t have to stick to anything, you do what you want to do, you know, it’s your quilt, you do what you want to do. I always change everything to suit myself, to make it easy for myself but, yes. BT: Blues. I’m a very much, you can see that’s very much blue, can’t you [PS: Yes] I do love blue. The backing of this was interesting. It was in a roll in a bag of stuff. I paid £5 for it and it’s really pretty. The backing is blue and gold and Jan found it and she said ‘that would go beautifully on the back of your quilt’ [PS: Yes, it’s lovely] yes so I really love that, really, really so. BT: So, I was pleased with that. BT: I have made, I have made a purple and yellow one. Jan said to me one day ‘you must try other colours, you’re not to stick to the same colours and she came with me and she chose purple and yellow and it was OK but I gave it away because I couldn’t stand it in the house [laughs], so I gave it away as a raffle prize and actually the person that won it was thrilled, I couldn’t believe it, but purple yellow goodness! [PS: There we are] Yes [PS: Everyone to their own] Yes, basically. BT: This quilt, the dolly quilt I’ll never give away. 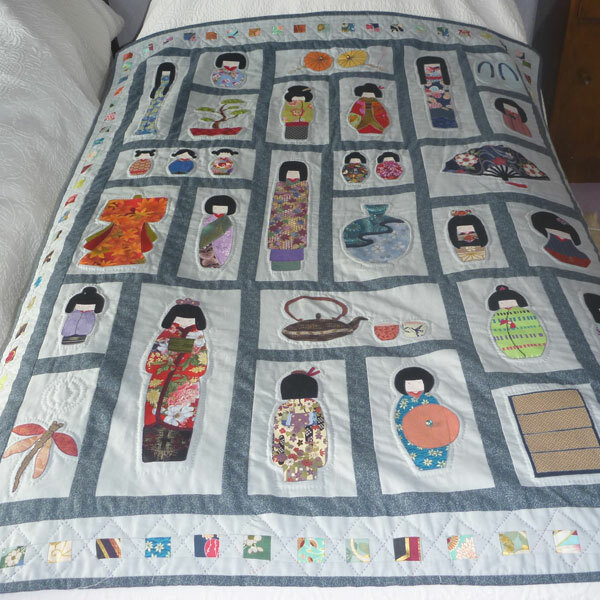 You know I’ve got a granddaughter who would probably love it, but I made this for myself and, uh, I’ve given a lot, my two kids in Australia have got quilts I’ve sent out to them and it was, you know, they’ve loved those. Those were Japanese fabrics [PS: Right, yeah] from a Susan Briscoe design. Really lovely. And I’ve made a couple. I’ve done a couple of hexagon quilts that my daughter’s got in Australia and they were pretty. I love Kaffe Fassett fabrics and love the colours in that and I’d edged it all the hexagons in Kaffe Fassett and it’s really nice. BT: He’s a designer and yes he does knitting, tapestry, everybody in the quilting world knows Kaffe Fassett. He’s a very, um… flamboyant man if you like, very nice, I mean we see him in the quilt shows and things but his colours are just wonderful. If you like that sort of thing. Some people don’t, I love it. [PS: Yes] It’s in your face basically [PS: Yes] yes. And he does cabbages and things and fruit and things like that, [PS: All sorts of things] all sorts of things, yes [PS laughs]. PS: Right. So, it was interesting in your pre-interview list that you gave me you talked about quilting completely dominating your life. We touched on that really. Are you happy that it does that? BT: Oh yes, oh yes, I mean what else would I do? You know because I don’t sit and watch television, I love music so I can quilt and listen to my music. I travel to see my daughters in Australia so I take quilting on the plane with me and do it over there and go round the shops and it gives you just an interest, you know? PS: Mmm. And you mentioned joining Cibi is it? BT: Cibi, Cibi in Abergavenny. Cibi’s a quilting group. PS: What does Cibi mean? BT: Cibi is the name of the local river [PS: Aah] yes. And they meet in Abergavenny and there are about thirty people and it’s only two hours but it’s just enough really. PS: Do you, I mean you appreciate that time spent with other people? BT: Oh, it’s lovely. It’s lovely. And that’s what’s so important about the Guild as well because I just love the regional days, I really do. The quality of the speakers is superb. The committee are marvellous, I’m saying that because I’m one of them! [Both laugh] But they are very enthusiastic and I just think the regional days you meet so many different people. ‘Cos I’ve only been doing it for three years and I went up to the Festival of Quilts this time and I knew so many people, it was unbelievable. Every corner we went round you know we met somebody, you know. It was really lovely. PS: So yes, was that different from say calligraphy? BT: I never met people in calligraphy. No. It was a very solitary thing to do really. Yes. But no, quilting’s so varied and you can do so much. I mean we held a show in the church. You know people from all over came and it was really nice and people were very complimentary as well. But the standard of quilting in this area is superb! Now I went up to the Festival of Quilts this year. I’ve got a lot more critical and I just felt some of the quilts, some of the quilts were outstanding, I mean they were just, they knocked you for six. But there were a few there that you felt ‘oh gosh, I could have done as well as that’ you know. So, which is quite heartening really isn’t it? [PS: Yes] Because you think if they can show, you could, you know [PS: Yes] which is quite nice. But I look at blogs on the computer and I look at the American blogs and they’re just wonderful because the Americans are not shy in coming forward and they say ‘and look what I’ve done today’ and it’s dreadful! And you think ‘I would never put that picture on the computer for people to see’, but they don’t seem to care which is a lovely way to be, isn’t it? That’s great, you know. They’ve obviously enjoyed it [both laugh]. Yeah. PS: You say you’re getting more critical, and I’m sure you mean that in a, you know, you obviously appreciate. BT: In a good sense. Yes, yes. PS: You appreciate, you critique it rather than criticise [BT: That’s right] it. BT: That’s right. Yes, I would never do anyone down. I mean you know everybody who does it, it’s the best they can do and that should be applauded. PS: Do you think there are, sort of, thought police out there? You know people who are judgemental? BT: I’ve never. I’ve. I’m a quilt policeman. ‘Oh look at that!’ I say. But no I don’t think so, really. I mean I’ve just got… do whatever, would anyone dare criticise me? [laughs] No. I just don’t, I think it’s nice to see what other people do isn’t it? [PS: Yes] And it’s not as if you’re earning your livelihood and it’s got to be absolutely perfect. You do it for the fun of it and the enjoyment. Once it starts getting like that I’d give up. [PS: Yes] You do it for the love of it, mm. PS: So you were talking about improving, and improving your hand quilting and things like that [BT: Yes] so there’s a certain amount of skill building that’s essential. BT: When I started it I thought ‘I am never, ever, going to be able to do this’ so I took myself down to Busy Bees which was a shop in Newport. It was in a lovely house and I’ve forgotten the name of it for a moment [PS: Tredeger] Tredegar House, that’s right. But their shop was burned down at Christmas and they re-opened. But before the shop burned down I went to one of their courses run by, oh dear I can see her face. Will you just stop that for a minute [PS: Yes] and I can just… I’m sorry, the lady I was thinking about is Barbara Chainey. Now she’s written loads of books on quilting and done loads of pattern books and she’s really, really good. But she did the most wonderful course and she’d brought old quilts for us to feel and look at and then she told us about the rocking motion and how we should do it. BT: You’re moving your hands. Yeah, you sort of rock your hands so that the needle goes through and you use your thumb then to feel the needle to be pushed over and through and it’s called the rocking motion. So I did a course with her and I got a lot better. And then I did another course with Sonia Fox in the Rhondda last year and she taught me to use a thimble underneath which made it a lot easier. And it suddenly came, you know? But it took me eighteen months of persevering to learn how to do it properly. It’s not something you can just start and think you can do. If you’re going to quilt properly it’s something you’ve got to practise and practise and practise and that is why the art is dying out because people these days want everything instantly. With quilting it’s a long term project. Things are going to take you a year to do, you know, and as long as you know that and you’re happy with that, that’s great. PS: Is that just hand quilting then, what about doing it by machine? Is that … faster? PS: Is that unusual, do you think? PS: Anything else you want to do to develop your skills? BT: I think that’s enough until I die! I don’t think I’m going to have time to do anything else [laughing]. I think that will keep me going really. And that’s all I want to do. I don’t want to do anything wonderful and great and things, it’s just for my own pleasure really. And lovely to be able to leave some things behind for my children. PS: Yes. You talked about sending quilts to Australia to your family [BT: Yes] and your granddaughter having the quilt [BT: Yes] that we’re going to photograph. How important is that to you? BT: Very, very, because it is nice to leave something of yourself isn’t it? BT: It’s a bit of an heirloom isn’t it and there’s so much. People say to me ‘oh, would you make me a quilt, I’ll pay for it’ and there’s no way that I would ever sell a quilt because part of me goes into these quilts… You know they’re very personal and I could never sell. I’ve given quilts away but I would never sell them. PS: So do you make a quilt purposefully because you know it’s going to be for someone? BT: Yes. Yes. I’ve made a football quilt for my grandson, and I’ve made a very pretty garden quilt for my granddaughter. And the children in Australia they’ve got Japanese ones ‘cos that’s what they like and… yes, I do specific things for specific people. PS: And then you source the fabric carefully? BT: Oh yes, I just go, whatever shops, quilt shops, I like quilt shops and I get it online as well. And there’s a quilt shop in America run by Jenny Doan called Missouri Star Quilt Company, have you heard of that? [PS: No] Oh my goodness, it’s just an experience! [Laugh] My friend is coming over from America, so I’ve bought some stuff from the Missouri Star Quilt Company and had it sent to her house and I had this email back saying ‘Mrs Thomas we’re just so delighted that you’ve chosen us to buy your goods from. As we speak, your goods are being collected by a beautiful young man bearing a red cushion travelling round the store [PS laughs] picking up your things and they are going to be boxed up and taken by another beautiful delivery man to the address given and we hope that you just have such a lovely time with it’ and it goes on like this, well I was weak! I thought that was the funniest thing I’ve ever heard! [Laughing] But she does the most amazing videos, Jenny Doan and she does about thirty videos and you can learn to quilt just by watching her. She makes it so easy and they’re just wonderful and if I’m bored at all, there’s nothing on the telly I’ll just stick a video on and watch her! 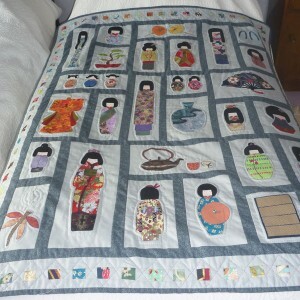 She’s wonderful, absolutely amazing and she, she goes ‘oh, this is such a darling quilt’ [laughing] I just love her! I’d love to meet her [both laugh]. PS: Do you think the Americans are a big influence then? BT: Oh I think they’re huge, they love it. And the Australians love it as well. And there’s loads out there, really lovely shops. No, and I think and wherever you go in America you walk into a shop and they’ve got quilting stuff, you know, in the stores. It’s like the clothes. I mean I used to be a very big girl, I’m a big girl now but I used to be a very big girl and on the clothes rails with the size 6s and 8s were the 26s and 28s and everything in between. They’ve got everything and it’s the same with the quilting. You go into a department store and there’s a huge section on quilting. How lovely is that? Because the shops are getting fewer I think in this country. I mean it must be so expensive to set up and start up. Although we’ve just had a shop open in Llantrisant which is about eight miles from me called, um… The Patchwork House, that’s right and Sue is a member of the Glamorgan quilters and she is lovely and will do anything to source stuff for you and she’s so helpful and so amenable that we all flock to her now because we know she’ll get it for us and she’s great. And in fact this fabric round the edges came from her and the sashing came from The Patchwork House in Llantrisant, because it’s a Japanesey-type fabric [PS: Yes] it’s really nice [PS: Yeah] and she’s just so helpful, she’s lovely. PS: Where did you get the plain fabric from? BT: I think I got that from Doughty’s [PS: Right] in Hereford [PS: Who are?] They’re another big patchwork and quilting shop and they’ve got lovely stuff and they’re a, it’s a family business and they do roadshows as well so they come down to this neck of the woods and we go and buy stuff there. Yes. BT: Yes, you’ve got to know them, that’s right. It’s like the Underground Railroad, you know. You do learn about things, it’s really amazing. Yes. So that’s very good. PS: It’s not just techniques then. BT: No, and I, actually it’s the people make it, they really do because I’ve become very good friends with so many people, you know, and it’s… I’ve got a whole new, new sort of life now. Lovely. PS: You just see yourself going on [BT Yes, yes] till you drop? BT: Well I think I will. I shall probably die with a needle in my hand and a smile on my face [both laughing] I hope so! PS: Have you anything else you want to sort of add? BT: I’ve really enjoyed doing this, it’s been quite an experience so thank you very much for asking me.